Heliopolis to join NJProghouse Homecoming Weekend 2014! Due to a scheduling conflict with Project RnL, they will be unable to perform at the NJProghouse Homecoming Weekend 2014. The NJP home offices have decided to use our secret time travel machine to bring one of our acts planned for 2015 to the 2014 Homecoming Weekend Stage. Conceived in autumn 2012, Los Angeles based Heliopolis (Greek for “City of the Sun”) set out from the start with one primary goal in mind: celebrating the uplifting power of music. Comprised of former members of acclaimed progressive rock acts Mars Hollow, Ten Jinn, and Genesis tribute Gabble Ratchet, Heliopolis is a forward-thinking musical collective on a mission to deliver the very best in contemporary progressive rock music paired with an ultimately optimistic message. 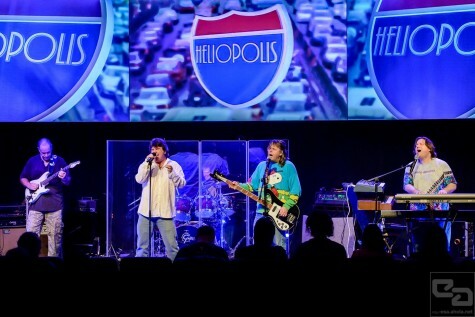 Heliopolis compose intricately detailed long-form songs based on memorable melodies, 4-part vocal harmonies, outstanding musicianship and thought-provoking subject matter, delivered by five musician friends who share a commitment to passion, sincerity, and integrity. In 2013, the band wasted no time writing and recording their debut album “City of the Sun” while simultaneously undertaking a string of well-received performances on the West Coast (Berkeley, Los Angeles, San Mateo and Santa Monica, California as well as Mexicali, Mexico); in so doing, the band proved their viability and commitment to excellence onstage, wowing audiences with their intensity and enthusiasm. “City of the Sun” (scheduled for release in August, 2014) confidently delivers a cohesive and imaginative musical statement recalling classic albums from the golden era of progressive rock while remaining firmly grounded in the present. “We enjoy mixing our influences, putting ideas in a blender and, hopefully, surprising ourselves with the results,” says keyboardist Matt Brown; “There are no limitations,” continues guitarist Mike Matier. Heliopolis is honored to perform at the renowned NJ Proghouse’s 2014 Homecoming Weekend. Heliopolis is Jerry Beller (drums and vocals), Matt Brown (keyboards and vocals), Kerry Chicoine (bass and vocals), Mike Matier (guitars) and Scott Jones (voice).